I recently saw an entire arrangement of hooped needleart. The designs were gorgeous and perfectly executed. But, it seemed disjointed … floaty. For my aesthetic, it was wanting some “look at me” element. It was wanting the perfect frame for the perfect art. Since this piece is on my white front door, I wanted a more “look at me” factor with the framing hoop. So after joining the last single crochet to the back loop of the beginning single crochet, I worked 2 double crochet stitches in the back loops of each single crochet around. I cut and secured the yarn to the beginning double crochet and hid the yarn ends. To make the inner “mat” of the hoop frame, I attached 3 strands of green to a front loop of the initial single crochet round. I then made a single crochet in the front loop of each single crochet around. After securing, cutting and weaving in the yarn ends – this hoop frame was ready for it’s embroidered face. Personally, I like a nice and tightly woven Kona cotton for embroidery, but I have also been known to pick up linen and cotton napkins at garage and estate sales to use as embroidery backgrounds, Regardless of where I purchase and what I use, I begin by ironing the fabric and starching if needed. Using your hoop frame, mark the fabric “lightly” the circumference of the interior hoop. This gives you your design field. Transfer your design. You will notice that I drew each sunflower seperately. You can postition as you choose to create the design of your choice. To finish – choose a backing fabric (I chose felt) Cut a size that you will be able to stitch or glue to the back of your hoop frame. (in this case, it was the size of a 10 inch dinner plate). Use an adhesive spray or a fusable to attach the embroidered piece to the backing fabric. Cut the backing fabric and the embroidered face to fit the hooped frame. Hand stitch or glue to the back of the hooped frame. Since I wanted another layer of dimension, I crocheted the sunflower and stitched it slightly offside of the bottom of the finished piece. If you want to layer in this manner, but do not want to crochet, most craft stores are abundant in their stash of silk flowers that can be cut and attached. Now you have the Hooped art that is completely original to you and your “multi – making” craft aesthetic. Collectors are a determined breed of people. We will quest, ad infinitum, for that desired piece to add to our collection. Doll collectors take this determination to an even higher level, as, more often than not, we are questing for the dolls, the clothing and other accessories that belong to a particular doll. There are times that finding a “complete doll” is as rare as finding a unicorn with our “complete doll” perched on top. I am a baby boomer age collector. Most of the dolls I collect are the dolls from my childhood. This pattern is to create a gown for one of my collecting favs – the 5 inch Tiny Teen doll. Row 3; Ch 1, Work 1 sc in each of the next 3 stitches. Ch 7, skip 2 stitches, Work 1 sc in the next 10 stitches. Ch 7, skip 2 stitches,Work 1 sc in each of the remaining 3 stitches. Row 5; Ch 1, Work 1 sc in each of the next 8 stitches. *(Work a sc dec through the next 2 stitches) 2 times. * Work 1 sc in each of the next 2 stitches. Repeat from * to *. Work 1 sc in each of the remaining 2 stitches. With Right side of top facing you, Join thread with a sl st. Work 1 sl st in each of the stitches across. With Right side of top facing in, join to beginning sl st with a sl st.
Rnd 2 -6; Ch 2, Work 1 dc in each stitch around. (40) Join to beginning dc with a sl st.
Rnd 7; Ch 2, *Work 1 dc in each of the next 4 stitches, Work 2 dc in the next stitch. * Repeat from * to * around. (48) Join to beginning dc with a sl st. Turn the gown to right side facing out. Attach thread to the top left side of the neckline (top of the “V” opening in the back) with a sl st. Work 1 st sl AROUND THE POST of each stitch of the top’s row 5. After working the last sl st on the top right side of neckline, Ch 5 (this acts as a loop for the “bead button”) sl st in the same stitch. Work 4 more sl st down this same side of the “V” opening in the back. Ch 5, sl st in the same stitch. Work a slp st in the base of the “V,” Evenly space 5 sl st along remaining side of the “V” to Top of gown. Join to beginning sl st.
Sew each bead / button in place opposite of loops. I collect Liddle Kiddle dolls from the 1960s. Some of my “rescue” dolls get rehabbed in to fairies for my granddaughter . 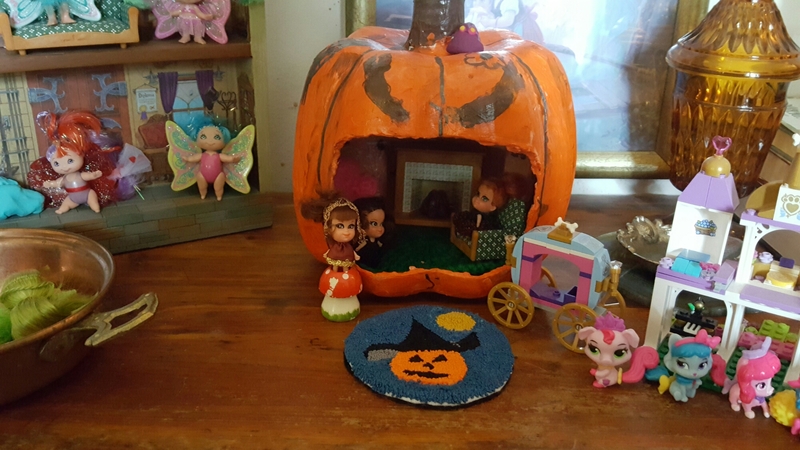 Well, these fairies needed an autumnal home … and we made one. I’m not big with paying the going rate for the carvable craft pumpkins, so we went paper mache . We (meaning my 6 year old granddaughter and I ) found a few paper mache pumpkins for under 5 dollars. I carved the opening with a craft knife. Then a few coats of gesso (don’t skip the gesso!) a coupla coats of acrylic paint and then a sealer and viola! 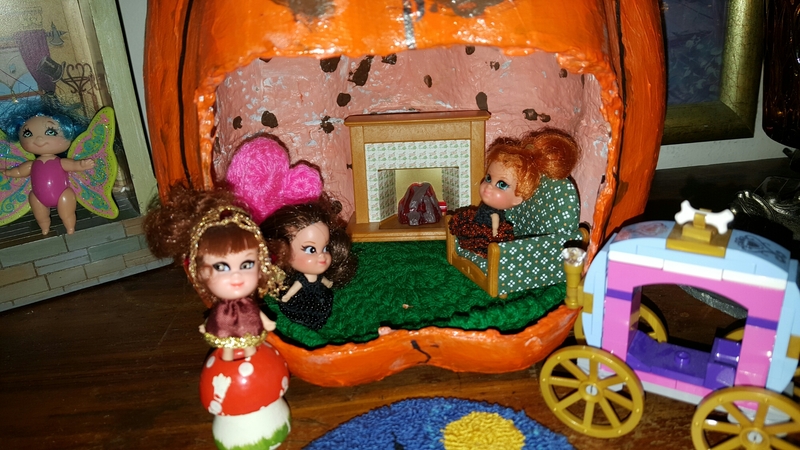 A pumpkin cottage that any fairy would love to call home. The carpet is crocheted in worsted weight. The pink chair is the miniature doll chair that is a free pattern on my blog. The fireplace and the other chair are from the calico corners critter collection. This was a great weekend project (with some drying help from the hair dryer) Excluding the dolls and the furniture, the cost of this project was well under 20 dollars. I am still experiencing my learning skill with cross stitch, so any charts that I “put out there” are going to be pretty simple. (which can be a plus, since you can make them quickly and while watching TV, etc) When I drafted the colors of the chart, I was working on a white background. HOWEVER, when I did the sample, I worked on a cream background. No big deal, right? As I worked the chart, I grew more and more disgruntled with the colors. Then I had one of those “duh” eureka moments! It was a big deal to switch from a white background to a cream background. I had to shift my color palate to complement the cream 14 count aida. So if you notice the difference in colors between the chart and the finished piece – now you know the reason. The crocheted frame is offered as a paid pattern. There are currently 3 size variations of the frames included in one pattern. The patterns will be available via my Ravelry, Craftsy and Etsy storefronts.